Some guy comes up to me as I am moving my ML into a perfectly legal Tuesday from 8-10AM spot just a few hours ago. "You're gonna get towed there." he tells me. I look at him and he appears to be your typical brooklyn hipster, wearing a beanie and smoking a cigarette. "I park here all the time and it's perfectly legal" I tell him. I ask, "Do you park in this area?" He goes "No I don't own a car". 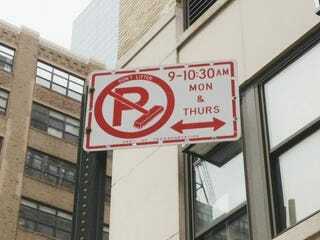 Me: "well there's a whole complex strategy to the New York Parking system." Him: "I know how the New York Parking system works"
Me: *lock the doors to my car and walk away* "Have a good night"
It really bothers me when other people get in my business with clearly nothing helpful to share. Mind your own business, your life will be much better. Just after writing this post, I checked @NYCASP, the official alternate side twitter account, and alternate side parking is suspended tomorrow. Therefore, moving my car and talking to the putz above was all for naught. *le sigh*. Classic Car Club Manhattan is looking for detailers. Are You Worthy of The Best Job In Motoring?